Some people might not think of winter as the appropriate time to purchase trees, but the Kentucky Division of Forestry (KDF) is encouraging citizens of the Commonwealth to purchase seedlings now for spring planting. The KDF’s first nursery was started 103 years ago and was located at what is now the Louisville Fair Grounds. The current two nurseries in use are located in Marshall and Morgan County and have been in operation for approximately 50 years. The seedlings grown and sold from these nurseries throughout the years have enabled citizens to carry out reforestation efforts throughout the Commonwealth. Ideally, the early spring (late February through mid-April) is the best time to plant, however, now is the best time to put in your order and reserve the seedlings of your choice. Morgan County nursery main entrance sign. John P. Rhody Nursery sign. Persimmon at one of the nurseries. Oakbed at one of the nurseries. Rhodyash in one of the KDF nurseries. One of the seedlings from the KDF nurseries. Black Walnut and bur oak being planted by hand. According to Gracey, when purchasing trees for landscaping, the first thing to consider is if the tree is the right tree for the space. Call (811) to have your underground utility lines marked. This service is free. Plant at least 10 feet from the main overhead utility wires. Avoid planting directly underneath lower overhead wires that connect to your home or building. Allow trees room to grow by considering distances from other objects. Plant at least 10 feet from a building. For shorter trees, Less than 30 feet tall: consider planting one of the many dogwoods, flowering plum, pawpaw, hazelnut or an eastern redbud. Are you looking for something a little taller? Consider a tree in the 60 to 80 feet height range such as sassafras, persimmon, black locust, Virginia pine, shortleaf pine, blackgum, black oak, chestnut oak, chinkapin oak, pin oak, post oak, swamp chestnut oak, swamp white oak or willow oak. Do you have a lot of space and want shade? Consider planting a white oak, sycamore, northern red oak, yellow-poplar, black walnut, baldcypress, loblolly pine, black cherry, bur oak, cherrybark oak, shagbark hickory or shellbark hickory (these tend to be our most popular varieties, so order fast while supplies last). Lower your cooling costs by planting trees to shade the summer sun. Plant on the southeastern and southern sides to help shade your home from morning sun. Plant on the southwestern and western sides of your home to maximize afternoon shading. To provide a barrier from sound, site and smell. To reduce heating and cooling costs and add value to the landscape. Division seedlings are priced so landowners can inexpensively plant large areas converting idle or unproductive ground into growing forests while helping to control erosion and providing important habitat for game and nongame species. You can call the division’s regional office serving your area for assistance on choosing the right combination of trees for converting your land. For large plantings, the division also has tree setters for loan. Nursery seedlings are priced quite reasonably, due to the fact the KDF nurseries are the only large scale producers of bare root seedlings in the state. This means that no dirt is attached to the roots of the seedlings. This allows them to be easily planted with a mechanical tree setter, or planting bar to get many of them in the ground quickly and efficiently and also allows the seedlings to be shipped. Seedlings being prepared for shipment. 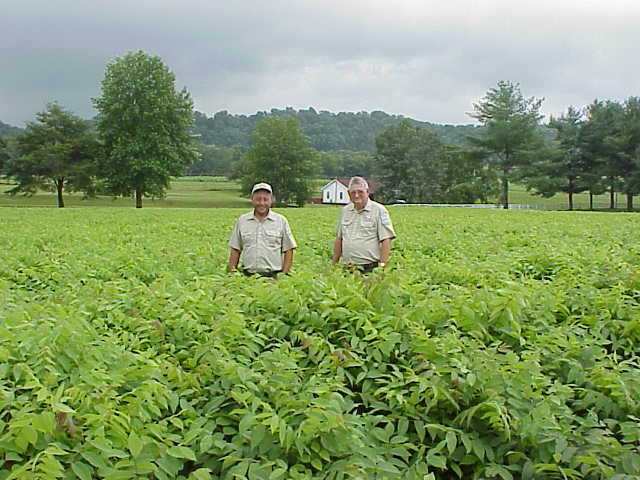 Order your tree seedlings now by visiting the KDF website and accessing the order form at http://forestry.ky.gov/statenurseriesandtreeseedlings/Pages/default.aspx. You may also call your local forestry regional office to learn more about species and price. The KDF asks that you do not contact the nurseries directly. For assistance with building a proper landscape plan for your yard, check out the Arbor Day website at https://www.arborday.org/trees/righttreeandplace/. Photos courtesy of the Kentucky Division of Forestry.